Living in New York City, Maria Beatriz Diaz’s first unofficial responsibility was to translate for her parents and help them navigate a new culture. They moved from Galicia, Spain when she was seven years old, and she quickly learned English and adapted to life in the big city. A city girl through and through, she obtained both her bachelors and law degrees at New York University. She then practiced law as an associate for Roger & Wells (now Clifford Chance) for seven years before Reuters Group PLC recruited her. Diaz explains that they were looking for someone with her multicultural background. The global company wanted someone who could act as a business partner, and Diaz had the insight and experience required for the role. 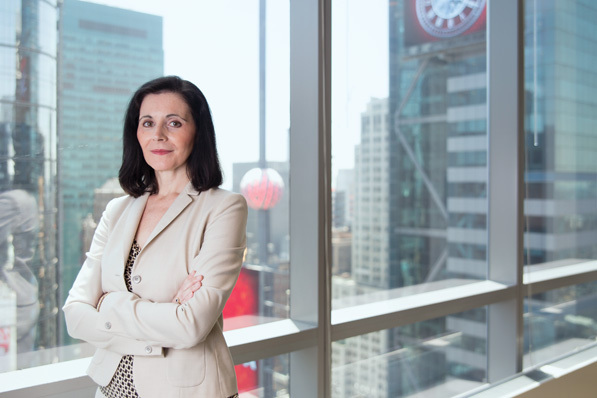 “I recognized there was a unique opportunity for me at Reuters,” she says, “and I was willing to take a risk, based on instinct.” Diaz now serves as senior vice president and principal legal counsel for the merged Thomson Reuters. Since then, she and the legal team have banded together with the business to tackle major challenges, such as integration, financial crises, and Superstorm Sandy’s destruction along the East Coast. “One of the aspects I value most about Thomson Reuters is that in a crisis, the company effectively comes together and delivers,” Diaz says. Her work experience is diverse, including recent projects handling complex commercial negotiations with major clients, negotiating strategic alliances, and managing investigations and litigation. Diaz and her team work with clients and partners internationally and manage a variety of legal matters. She is an integral part of the company’s operations, from product creation and support to sales and marketing.